Family is the most important thing in the world and nothing can come close to those important bonds you create with your children in the first few months of life. It is amazing with all the research that even today, there is still not a universal PAID maternity and paternity leave. Read more about this paternity leave pioneer who changed history in the US. In 1973, Jerry Cammarata made history by becoming the first father in the United States to fight for and win paternity leave from the New York City Board of Education. As a result of the national attention he received, Dr. Cammarata was appointed to the White House Conference on Families by President Carter and later served as Commissioner of the Department of Youth and Community Development under New York City Mayors Rudy Giuliani and Michael Bloomberg. The newly revised edition sets forth to enlighten new generation of parents and grandparents. A resource and teaching tool for parents, the central theme is that humans should emulate their counterparts in the animal kingdom. By looking at how the animal kingdom raises their young, readers can learn how to be accepting of each other, their diversity and individuality of parenting. It also addresses the current state of affairs on parenting globally and ways to reach out to legislators on the issues of parenting and paid family leave. Before I dive to deep into my review, I want to say that I am a strong believer of paid parental leave – whether it be for the Mother or Father (or ultimately both). The bond between a child and their Father is extremely important and I feel that too often it is ignored. Dad can and do a great job at parenting at every day and they should be a valued and respected for their role in the home. I wish as a society we can remove that image from our head of the typical Father figure that goes to work, comes home is the authoritative figure but that is pretty much it. Children thrive when they have a Dad that plays with them, cuddles them, takes them out, helps them with homework and the list goes on and on. My husband is one of these Dads and while he never received paternity leave with our first child, he worked shifts and because I went back to school part-time he spent a of one on one time with our son and it made a huge difference. 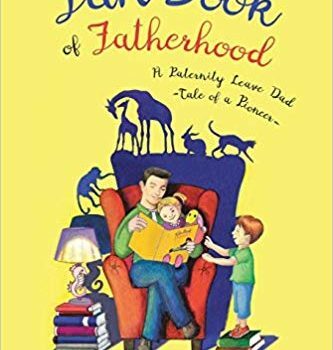 Now before I get to off topic about something I am passionate about, this book does touch on the importance of paternity leave and the role of the Father but it is so much more than just this. I loved that Jerry was open with how others responded to him when he said he was going to take paternity leave. I would like to think things are different now but I can sadly here some of those same comments coming out of individuals mouths when a Dad wants to spend time with his child on paternity leave. The book also covers parenthood in general because whether you are Mom or Dad or both, parenting is hard! Jerry covers parenthood from a whole new angle – from the view of the animal kingdom. We actually do have a lot in common with our furry animal kingdom both small and large (mostly – wouldn’t want parents eating their young!). There are a lot of lessons we can and should learn – like letting our child take their time to develop (they will get there), how to potty train and how to focus on the relationship first. I love that he gets his children involved and not only is this great for their building their relationship but education wise it is fantastic. 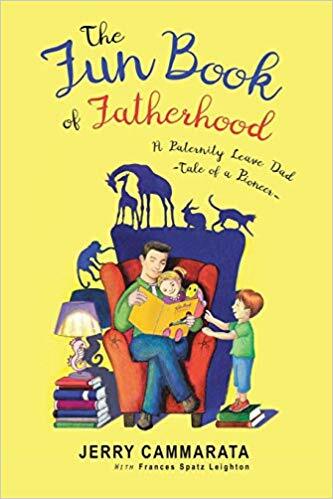 This was a well written book about Fatherhood and parenthood and the struggles we all face – whether it be parenting in general or society’s perception of how we should parent. It empowers parents to think outside of the box and to appreciate, respect and understand the many different ways we can parent and there is no real right or wrong (unless it is neglect). It was witty and fun with an edge of seriousness making it a great read for new parents and seasoned parents alike. You can find more on his website and purchase a copy of this book on Amazon. DR. JERRY CAMMARATA wrote the original The Fun Book of Fatherhood in the early 70s and went on to becoming a weekly columnist on parenting in New York. In 1979, he was appointed to the White House Conference on Families by President Carter, where he worked with Coretta Scott King, among others, on reshaping parenting issues in the U.S.
As a result of his activism in family issues throughout the 70s and 80s, as well as his commitment to public education, Dr. Cammarata was appointed by New York City Mayor Rudolph Giuliani to be the Commissioner of the Department of Youth and Community Development, while also maintaining his position as a Member of the Central Board of Education of NYC (the same BOE which gave him his historic Paternity Leave). In this unique capacity, Dr. Cammarata was involved in the education of over 1 million public school students, as well as after school programs in community centers, schools and parks throughout the five boroughs of NYC. Dr. Cammarata’s life has been filled with family and opportunity. Educated in both parochial and public schools. he received his college education at Hofstra University and did post-graduate work at NYU, CUNY and CCU. In addition to his doctorate from CCU, he holds honorary doctorates from Mercy College and Dowling College, and has enjoyed teaching privileges at CUNY, Wagner College, and St. Joseph‘s College. He is a licensed Speech-Language Pathologist as well as a licensed and board-Certified Audiologist. Over the last 45+ years, Dr. Cammarata has continued to write on children and parenting issues, while enjoying his grandchildren. He now enjoys his clinical and academic roots as the Chief Operating Officer, Dean of Student Affairs, and Associate Professor at Touro College of Osteopathic Medicine in Middletown, NY. You are spot on! Having a Dad with an active parenting role is crucial for the emotional well being of a child! Good Review.